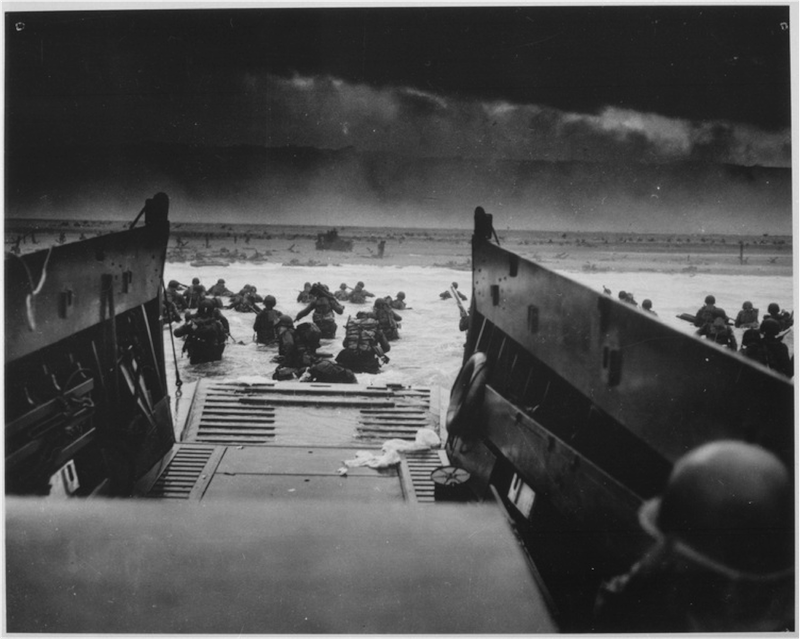 The invasion of Normandy, which was named Operation Overlord, launched on June 6, 1944, and was one of the largest amphibious military assaults in history. Saturday, June 6, marks the 72nd anniversary of Operation Overlord, commonly referred to as D-Day. 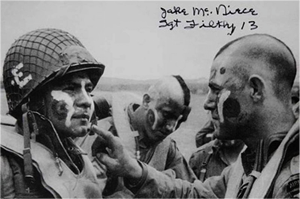 A major operation during World War II, and the largest seaborne invasion in history, it marked the turning point in the fight against Axis powers in Europe. Gen. Dwight D. Eisenhower, the supreme commander of Allied forces in Europe, gave this speech just prior to giving the order to begin the operation. 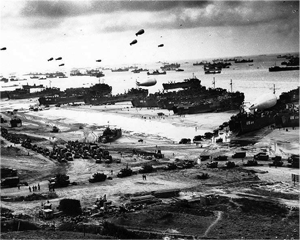 156,000 allied troops landed on five beaches, code named Gold, Juno, Sword, Utah and Omaha. British and Canadian troops overcame light opposition at Gold, Juno and Sword, as did U.S. troops at Utah. American forces landing on Omaha beach faced the fiercest resistance, suffering 2,400 casualties. 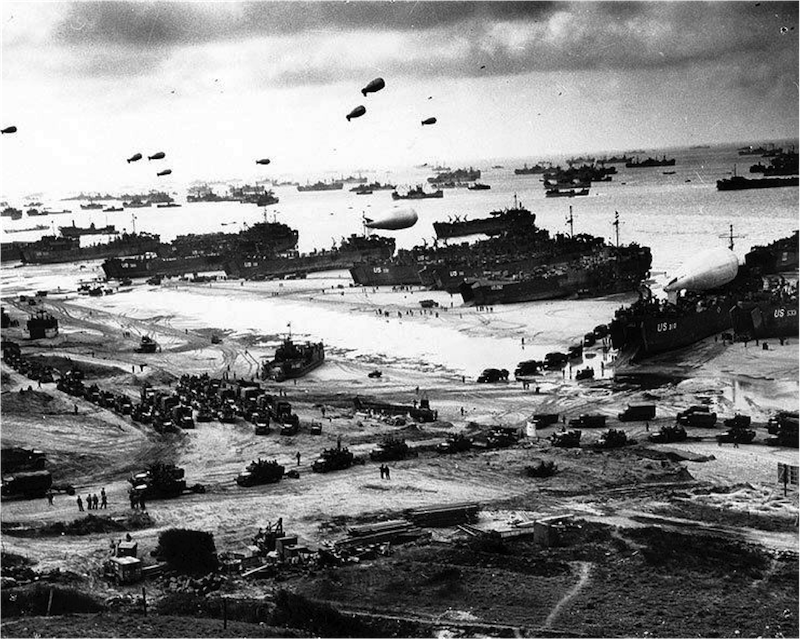 In total, the beach landings claimed the lives of 4,313 Allied troops, 2,499 Americans, and 1,914 others from Allied nations. In conjunction with the beach landings, 13,000 paratroopers landed behind German lines and secured key towns, bridges, and crossroads in order to break German supply lines and limit reinforcements. Below are eight historic photos from the days leading up to, during, and after one of the most brutal battles in contemporary history. Click on the photos to open larger versions of each image. 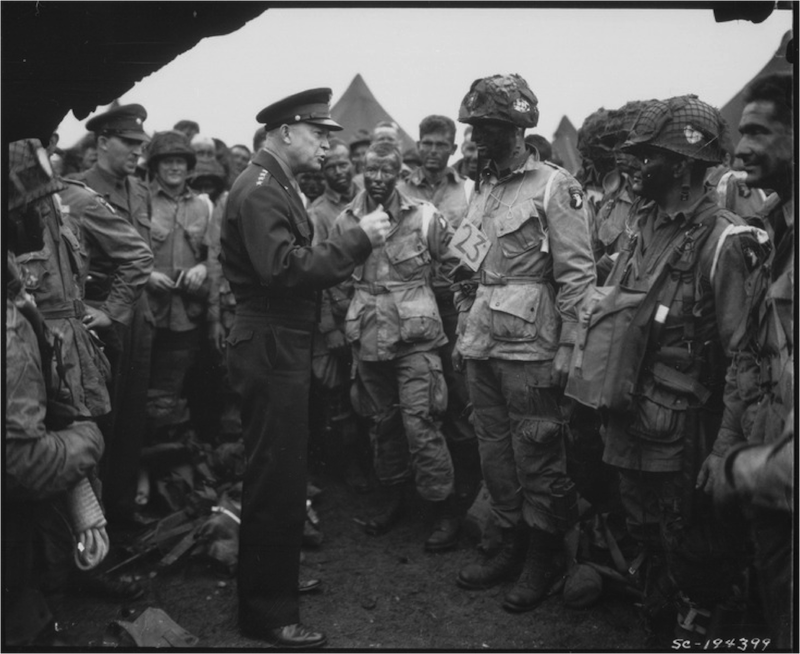 Gen. Dwight D. Eisenhower speaks with paratroopers who jumped behind enemy lines, June 5, 1944. U.S. soldiers assigned to the 101st Airborne Division, apply war paint to each other’s face in England in preparation for the invasion of Normandy, France, June 5, 1944. American assault troops in a landing craft huddle behind the protective front of the craft as it nears a beachhead on the northern coast of France, June 6, 1944. 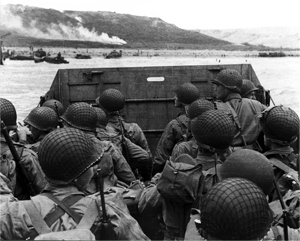 American troops disembark a landing craft and make their way to the beach. Carrying 80-pound packs, assorted gear and equipment, the landing troops had to maneuver across 200 yards of exposed beach before reaching cover. Some of the first assault troops to hit the Normandy, France beachhead take cover behind enemy obstacles to fire on German forces as others follow the first tanks plunging through the water towards the German-held shore. 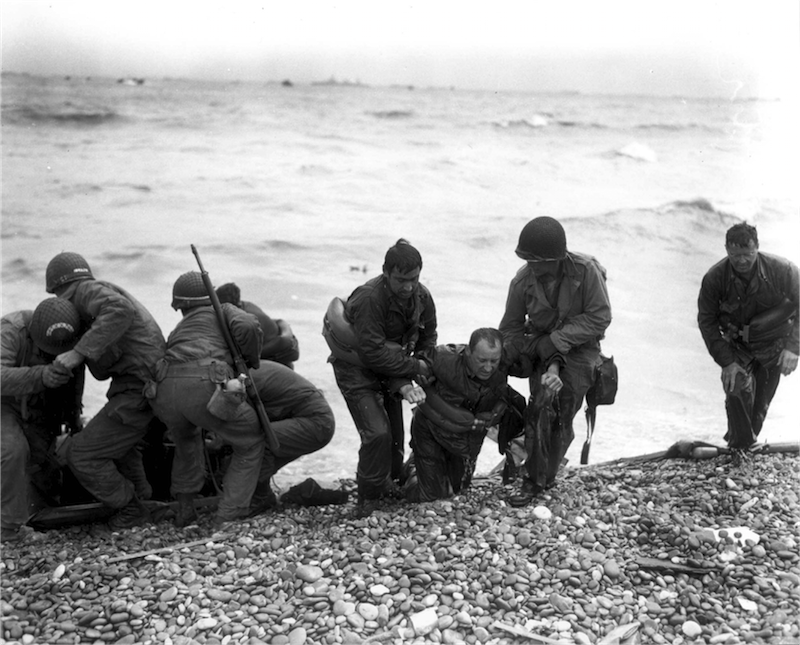 Members of an American landing party help fellow soldiers to shore after their landing craft was sunk by enemy fire. The survivors reached Omaha beach using a life raft. American assault troops of the 3d Battalion, 16th Infantry Regiment, 1st U.S. Infantry Division, who stormed Omaha Beach. 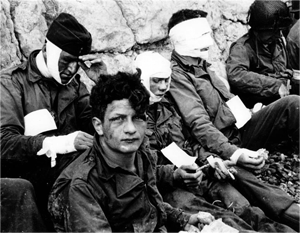 Although wounded, they gain the comparative safety offered by the chalk cliff at their backs, June 6, 1944.